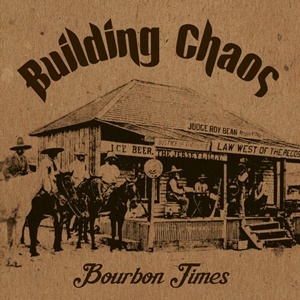 Welcoming variety and versatility on the site, Greek band Building Chaos certainly embrace a musical stew array of influences on their latest full-length album Bourbon Times. Active since 2005 and releasing two promo demos/EP’s in 2008 and 2014, the quartet believe in establishing a fresh blend of metal (thrash and stoner the most prevalent reference points) and non-metal aspects (Mississippi blues, country, southern rock) to establish their own take of heaviness. At this point in the game, it still feels as if the band still hasn’t quite found the key ingredients to firmly shape up a direct sound to latch onto – although there are hints of potential throughout. It seems with this set of songs, there’s a stronger emphasis on groove and hooks – especially with bluesy overtones where you’ll hear switch-ups between the electric and steel/acoustic guitar action. Check out the Southern country/blues swing within “The Hunt” and the subsequent slide harmonies that open “Let the River Bear Your Bones” for some old school picking, the latter containing a lower, direct talk vocal delivery during some of the verses while the back-half picks up into a groove/stoner metal arrangement. Whether intentional or subconscious, occasional riffs have obvious affinities for the past (“God of Thunder” sped up = the opening riff for “Snakefang”), but the band lead best when leaning on the mighty bluesy riff and throwing a bit of dirty distortion into the mix – “The King Is High” and “Until the End” delivering some tasty treats that keep things in a crunchy groove metal meets Zakk Wylde-era Ozzy state of mind. Two aspects severely detract the overall impact this material could make. First of all, the drum sound – especially in the snare department – has this water sprinkler tone to it that just sounds robotic, synthetic, and weaker than probably intended. The vocals also have a bit of a warbly nature to them – attempting to be forceful in spots and smoother in others, but never really reaching anything of stature (“D.O.W.N.” the worst offender in it’s up and down accented, hoarse melodies). With over 50 minutes of material to enjoy, Building Chaos still needs to firm up the foundation a bit before grabbing that ‘alternative’ audience they desire.